Red squirrels hoard food like cones and twigs in huge piles called middens. Some have been measured at 20 feet x 12 feet x 3 feet deep. Females are only in heat one day in late winter, when they will mate with 4-16 males. Red Squirrels have a sweet tooth. They may bite into the bark of sugar maples to start sap flowing, and then wait till the water evaporates and the sugar content goes up to about 55% (when fresh the sap is ~2% sugar). Squirrels can eat a variety of poisonous plants and mushrooms (like amanitas) without getting sick. In the original folktale, Cinderella’s slippers were made of squirrel fur, but a mistaken translation turned them to glass. A camel’s hair brush is really made out of squirrel fur. Identification: Rusty reddish/gray fur, with a whitish belly. The tail is outlined with a broad black band edged with white. In winter, has prominent ear tufts. Red Squirrels are about 1/2 the size of Gray Squirrels. Distribution: Alaska continuously across Canada to the northeast U.S. South to the Appalachian states and northern Rocky Mountains. Usually abundant in any kind of forest: natural coniferous forests, pine plantations, mixed, or hardwood forests; and around buildings. Diet: Pinecone seeds (especially white spruce), spruce buds and needles, mushrooms, willow leaves, poplar buds and catkins, bearberry (Arctostaphylos sp.) flowers and berries, acorns, beechnuts, and other nuts; seeds of hickory, tulip, sycamore, maple, and elm. 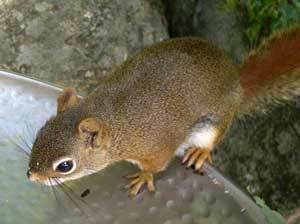 Red Squirrels are the most carnivorous squirrel, and will eat birds’ eggs and young birds. Above: A young red squirrel. Nest Identification: Red squirrels may build a leaf nest, called a "drey," in the crotch of a tree or on a limb at least 20 feet high. A nest in a cavity provides better protection. The nest is often made with shredded bark from a grapevine (as gray squirrel dreys.) The nest may contain twigs, damp leaves, moss, vines, and paper, lined with shredded bark, grass and leaves. 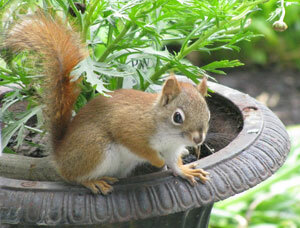 Nesting Behavior: A Red Squirrel will defend territory of between 2 and 5 acres from other red and gray squirrels. Nestboxes: Will use bluebird nestboxes, especially if hole is enlarged. May chew around edges of hole and excavate interior of box. Red Squirrels can be very destructive. Monitoring: When I opened a box with a Red Squirrel in it, it didn't budge. I don't know how sensitive they are to monitoring. Do NOT stick your hand in an occupied box, as squirrels have razor sharp teeth. Excavation or nest site selection: a hollow or fallen tree, a hole in the ground, a hummock, or a tree crotch, or a nestbox. Nest construction: May be made of shredded bark from a grapevine. I have seen nests made of napkins, and leaves and grass. Birth: Litter of 1-8? (usually 3-4) young are born March-April. Newborns weigh about 1/4 oz. Development: Young develop fast, and are weaned in 7-18 weeks. Departure: Leave the nest at 18 weeks. Number of litters: In warmer climate, sometimes have a second litter August-September. Longevity: About 7 years in the wild. Probably only 25% make it to sexual maturity (age 1 or 2). DETERRENCE: Signs of a Red Squirrel attack in a nestbox include: Eggs missing or broken in nest or on the ground, nestlings partially eaten in nest or missing (possibly one per day), occasionally a dead adult. 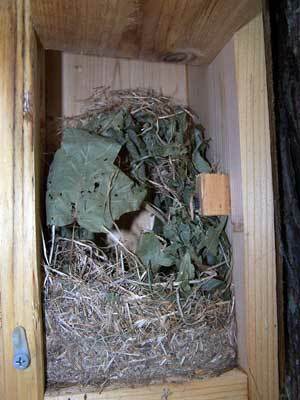 The entrance hole or interior may be gnawed, nestbox may be filled with chewed bark and leaves. Nestling corpses may be incorporated into nest. Especially likely in boxes mounted on trees/fence post/fence line. Leave the nestbox open or plugged in winter. Use a hole restrictor to prevent chewing and widening of hole. This also works well with Gray or Fox Squirrels. A fully grown female Fox Squirrel needs a 3" entrance). Add a predator guard (e.g., wobbling baffle on a pole). Do not mount box on tree or fence post/line, or 10 feet from the nearest jumping off spot (like a tree branch). Mount boxes 5-6 feet off the ground. Trapping has limited effectiveness. If you do trap, relocate squirrels 3-7 miles away. A Havahart or Tomahawk trap is best, and can be baited with shelled pecans, peanuts, peanut butter or apple slices. See photos of nests here and here.